The spring tour is announced. Check dates & venues on the Shows page. This poem does not please her, the new TVB book will be available at shows and selected shops (to be announced). You can read an excerpt on the projects page. You can watch an acoustic video session on Le Cargo. Troy plays Tropical, Queen of what? & Applause. Troy also played Tropical for Bruxelles ma belle. New reviews of ...Is with the demon on De la lune on entend tout and Le temps. One article on Simone A_review and an interview on My Music Factory. 6 songs of TvB appear on the soundtrack of Nolwenn Lemesle first film, Des morceaux de moi, released in France on Feb. 13th 2013. See projects page. Troy is #1 in the best of 2012 concerts on Mind Riot Music. 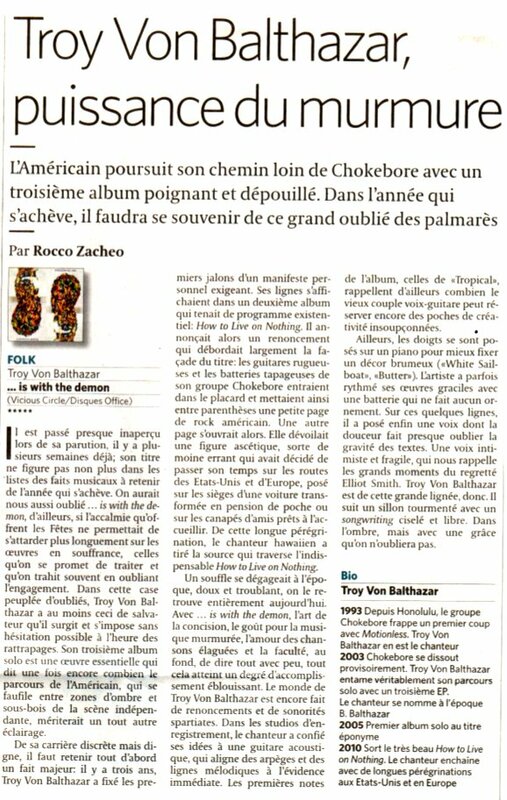 ...Is with the demon is #3 on Mind Riot Music & #7 on A découvrir absolument readers top albums of 2012. Magnified, a fine compilation of Troy von Balthazar and Chokebore songs will be released - as a free download - on March 11th by the french webzine My Music Factory. Xav Feugray "Heroic Little Sister"
Exsonvaldes "You are the sunshine of my life"
Alice the Goon "You, When you're drunk"
Leave her to Heaven " Tropical"
My Broken Frame "To a Girl with One wing gone"
Luis Francesco Arena "Smaller steps"
Sylvie Lacheray "Real Strong love"
Qu'en pense Gertrude "Took some Dollars"
Bonus Track : TVB "About being Hurt (First demo version)"